East meets West in pFriem EXP IPA #4. It’s inspired by the big juicy IPA’s of the Northeast, but has just the right amount of Northwestern haze. With zany notes of gooseberries and kumquats, you can enjoy the best of both sides. By the 1790’s the British were established in India and needed beer, which was considered a staple in every household. India, however, presented serious problems for brewers. Hot temperatures, poor water and short supplies of basic ingredients made it impossible to brew beer. Attempts to ship beer out of Britain to Calcutta failed. As craft beer has emerged and grown, so has IPA! IPA has helped grow Craft Beer to what it is currently today. There are now many shapes and forms of IPA, but they all share a bright aromatic hop aroma of citrus, tropical fruit, and pine. Hop flavor coats the tongue and these beers finish with an assertive, but balanced bitterness. pFriem’s EXP IPA #4 is inspired by the New England/Vermont brewed “Hazy IPA’s” or “Juicy IPA’s”. These beers are very hop-forward, tropical, round, and of course - juicy. In traveling to the East Coast and trying these beers, we found these hop-forward ales can be thick and turbid while others display a moderate haze. 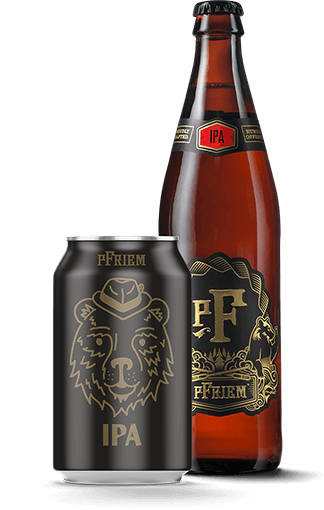 In pFriem’s Hazy IPA’s, we focus on the big tropical/juicy hop flavors balanced by a full body and a heavy amount of haze. The haze in these beers can be caused by many things: adjuncts, un-finished beers, adding flour, leaving lots of hop solids and particulates in the beer, heavy loads of yeast, etc. We choose to focus on the adjuncts, in particular, raw wheat and oats. We take inspiration from the classic German Hefeweizen, which strikes a beautiful balance of roundness from the wheat, flavor from the yeast, and a delightful haze that is not turbid or cloying. The result is a hazy, tropical, round, juicy, intriguing, but drinkable beer. Our EXP IPA #4 comes out of our R&D series called Exploratory IPA. In this program, we utilize the talents of our entire brewing team to push the boundaries of what we know is IPA. We brew these beers in small batches which allows us to take chances, try new things, or just play around and have fun with hoppy beers. In this beer, we really focused on the very tropical and punchy notes of hops grown in the Southern Hemisphere combined with a Hazy IPA base. Hazy sherbet body topped with fluffy white foam. Tropical aromas of melon, mango, papaya, and ripe citrus. Zany flavors of ripe peaches, honey dew, gooseberries, and kumquats. Finishes round and juicy with a cream cycle mouthfeel. Rich and hearty burgers, French fries and complex pizzas. Aged cheddar cheese, aged meats, and pickled vegetables. Indian cuisine that is spice forward and balanced by yogurt and cream based sauces.